This cute little girl went to my husband's cousin who graduated from 8th grade last week. I was going to have a little rant about kids growing up too fast, doing way too much way too soon, but I will spare you all! I'll just say that I think it is absolutely crazy to wear prom dresses (we're talking strapless, floor length gowns), and pay big bucks for a massive updo and makeup application for a flippin' 8th grade graduation and dance afterwards! Where do we go from there? Okay - sorry, I guess I ranted afterall! It's Memorial Day weekend - yeah! We don't have big plans - just stuff around the house, being lazy, and I hope lots of stamping! I hope you all have a wonderful holiday weekend! Details: Stamps, notecard, papers, ribbon and twinkles by A Muse, colored with Copic markers and Spica Glitter pens. Are you one of the Lucky 7? Make sure that you visit Linda's blog before Thursday, May 22 at midnight and leave a comment! You could win 7 amazing A Muse prizes! Help us celebrate 7 great years!! 7 Years of A Mazing A Muse! Happy Anniversary to A Muse! Here's to 7 years of the most amazing stamps, the best sentiments ever, beautiful paper and absolutely the best people in the stamping world!! Whoa - that was a lot harder than I thought - obviously, 7 is not a big enough list to be all-inclusive! I didn't even touch on the sentiments, which are one of the BEST parts of A Muse! Linda and A Muse have given me so much - I feel so incredibly blessed to be a part of this family! The team is really just amazing - I have made some great friends, and I have grown so much as a stamper thanks to the inspiration and guidance of this team! Thanks, girls - you've made me a better stamper! Linda, the A Muse Guru herself, with me and Lily last August at the A Muse shop in Seattle. 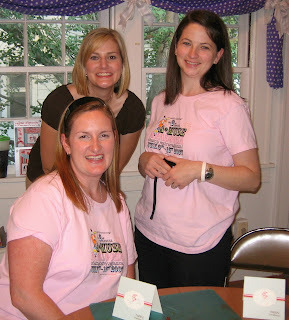 Me and my peeps - Sarah & Aura at The Ink Spot in St. Louis for A*Muse*A*Palooza last year. Sarah & I drove 4 hours to go to this event ... I can't tell you how many people said "you drove 4 hours for stamps?" To which we said "H-e-double-hockey-sticks YES!!" It's almost time for AMAP!! Wow, can you believe it??!! It's almost time for A*Muse*A*Palooza!! This year will be full of fun, games, contests, giveaways!! But, you have to be registered to play, so be sure to go to www.amuseapalooza.com and get yourself registered!! The fun will start on the AMAP blog on June 2nd, so stay tuned for lots and lots of fun!! This was my warm up card the other night ... you know when you are completely blocked and think there is no way that anything worth anything will come out of you ... and then, you calm down a bit and it does ... and all is okay with the world! The card is a weird size 3 1/2 x 3 1/2 - I have no idea how I ended up with a scrap, pre-folded, that size! 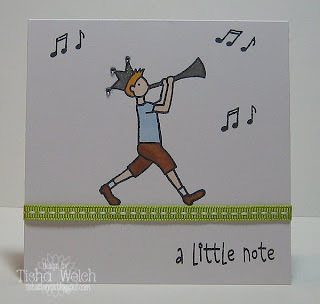 I must have cute down an A Muse notecard for something else! The blueberry Kitchen notecard scrap was also just laying there on my desk, waiting for some love!! In other news, the amazingly talented Lexi has been published again! Check out her card on the cover of this month's PaperCrafts magazine, and one inside, too! Go on over to her blog and give her some love! Congrats, Lexi! Details: Stamps, notecards, bling, CS by A Muse, punches by Marvy, ribbon by SU. Last weekend, I escaped the chains of motherhood and ran away to St. Louis for 48 hours with my friends Sarah & Aura. We had a great time - shopping, eating, talking all night long! Well, not all night, I am old, you know! The only really sad thing is that my camera made it out of my bag for exactly 3 pictures, one of which I would be murderized for showing online!! Here's Aura & Sarah enjoying our free beverages at the hotel on Saturday evening! Quick plug for the Drury Inn Chesterfield ... nice place, nice price, easy access back to KC! I'd stay there again in a heartbeat! I also had the amazing opportunity to meet with Beth Kindler, the genius behind The Saltbox Studio Stamps!! We met for coffee and had a wonderful time chatting! Be sure to check out all the awesome stamps that Beth has designed! She is really filling a void in this industry with her amazing primitive artwork! One of my all-time favorite people has started a blog to share her genius with the world!! The Amazing Tami Wood, one of the super talented A Muse instructors has started a blog called "It's All in the Details" - such a perfect name for Tami!! 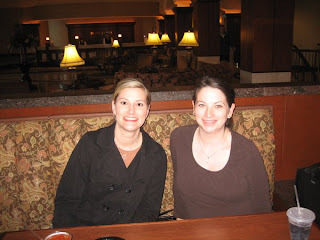 Check out this post for pictures of my visit to Minnesota when I got to meet Tami in person! Go give her some blog love!! I have a small problem, and it is spreading throughout my entire family! Because I love to stamp, and because I know that any card that I make is waaay better than something that I pay $4 for at Target or Hallmark, I just flat-out refuse to buy pre-made cards. RE-FUSE!! No way, Jose! Now, I am not too proud to admit that on more than one occasion, that has meant that people that I love, love, love dearly have received NO card, rather than receive a store-bought-pre-made piece of boringness!! So, this problem has spread ... to my mother ... who says to me the other day ... "You wouldn't want ME to buy a card, would you? Can't you just make me one?" I've created a monster! 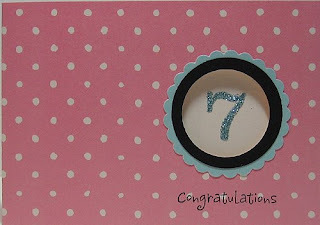 Long story for this cute, super quick little baby card! Details: Stamps, paper, twinkle stickers by A Muse, ribbon by May Arts, punches by Marvy & SU. Just a quick card for no particular reason! I love Patch - he is just too cute! Have you checked out all the new A Muse goodies that were released yesterday?? Wowzer!! That 8.5x11 paper is soooo pretty! And make sure that you check out Linda's Favorites! 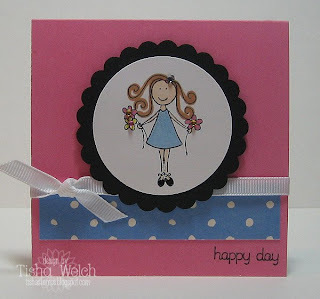 She has added some really cool stuff ... a neat stamp positioner, the Momento inks that I have been raving about, and a really pretty scallop punch that needs to come live with me!! Other news: My girls and I are still planning a quick trip to St. Louis this weekend - anyone know any awesome places in St. Louis to eat?? The kids are still kind of sick, but Ben wants to be super dad, and swears that he will be just fine!! You go, Daddy!!! We had a crazy weather night last night - the Tornado sirens went off 3 or 4 times around here, but we only got rain and a bit of hail. North Kansas City and Independence got hit really hard; the pictures on the news are pretty scary. Thank the Lord we were spared! Details: Stamps by A Muse, unknown brad? ?, CS from my stash. Today is the Day!! It's Release Day over at the A Muse News Blog!! 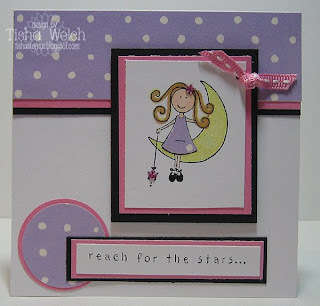 This is a great release with some wood mounted stamps, some clear stamps AND new notecard colors!! Shop till you drop! I wanted to get this last sneak peek up today! This is the other "half" of the Celebration Kids clear set! This poor little boy has been a bit neglected during the sneaks - his girlfriend has been getting all the love!! I just think he is darling, and this was a super simple card! One layer, Momento Ink (no heat setting, YEAH!! ), quick Copics, some ribbon ... viola!! The sentiment is from the Stitched Garden clear set released last month! I hope that everyone is doing well! I am waiting with bated breath for the weekend! I am escaping to St. Louis for a quick girls' weekend with Sarah and Aura! We are going to shop, and stamp, and eat yummy food ... with NO KIDS!!! Yeah!!! Details: Stamps, paper, ribbon, twinkle stickers by A Muse, Momento Ink, Copic and Spica markers.